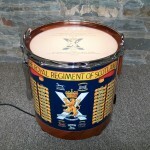 On 4th July 2013, Lt. Col. B. Wrench of The Royal Scots Borderers received the presentation gift of this bespoke Drum Table, by the Regimental Sergeant Major and Warrant Officers’ and Sergeants’ Mess, 1 Scots. I was commissioned to make alterations to the side drum and fit the engraved glass “drumskin”. An unusual project and not as straight forward as it appears, as it was slightly oval. The LED light inside shows the engraved glass very well. A recent trophy I made was a presentation chanter stand. The main base was maple, with two hand turned and carved rosewood columns supporting the chanter. A brass plate was engraved and fitted before being presented.